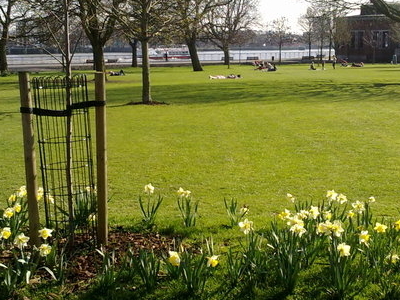 King Edward Memorial Park is a public open space in Shadwell, within the London Borough of Tower Hamlets, on the northern bank of The River Thames. It was opened in 1922 in memory of King Edward VII. 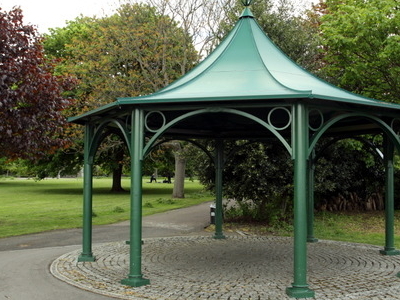 With an area of 3.3 hectares, it is the 11th largest park in Tower Hamlets. Along with a few others in the borough, it has received the Green Flag Award for quality, and is considered to have good biodiversity value. The Park includes a bandstand, waterfront benches, children's play area, bowling green, all weather football pitch and tennis courts. The paths and public toilets are accessible to wheelchair users. The Thames Path passes through the park. Here's the our members favorite photos of "Recreational Areas near London Borough of Tower Hamlets". Upload your photo of King Edward Memorial Park!